The mailbox & I in 2009 - don't ask about the picture...I was a goofy kid. I went out this morning about 8:15 am to go do my pet sitting jobs, and as I was walking to my car, I abruptly stopped because I noticed our mail box was on the drive away. 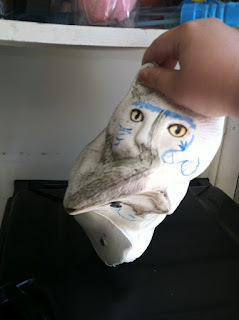 Being as tired as I was, I'm not sure if I really realized why it was there, other than it must have fallen off, or possibly someone ran their car into the mail post and it fell off (I had forgotten about the cat on the top of the box...you'll read about that soon). In the garage - you can see the wood on the bottom of the box. 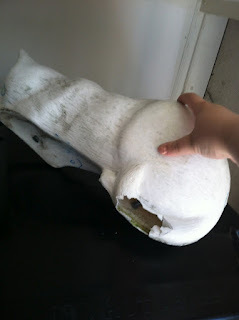 So I put the mail box into the garage and went to do my pet sitting jobs. I came back and ran upstairs to tell my dad about the mail box. This isn't the first time our mail box has been vandalized, this vandal act brought it up to a total of three times - the most recent having been ~ 10 years ago when I was 10. 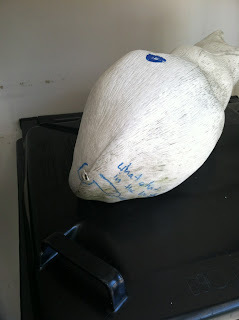 My dad figured it must have been vandalized, though I thought that it was a possibility it was something else, since whoever did it, had left the mail box and not taken it. Well, my suspicions changed when we looked at the cat topper from the mailbox, which had been left on our front steps. 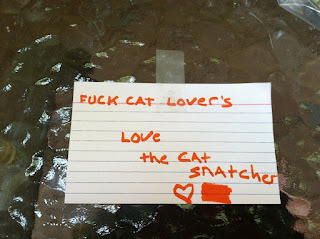 Not only had the cat been defaced with sharpies, the vandal left us a lovely note..."F*ck Cat Lover's. 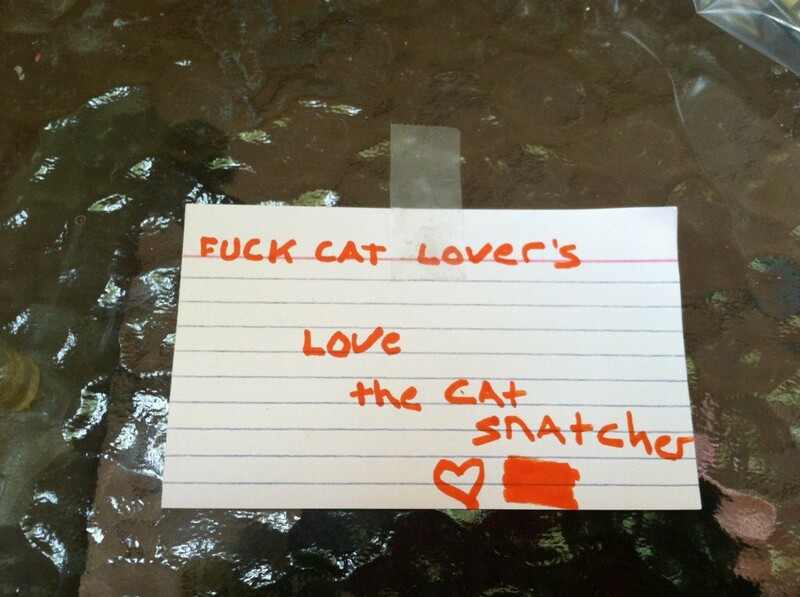 Love the Cat Snatcher." Lovely. After closer examination, the cat not only now sported facial hair, but female and male genitalia (someone didn't go to health class!). Plus leaving the cat for us, isn't technically snatching. Clearly this was the work of a petulant child. We knew from the note what their motive was - being a cat hater. 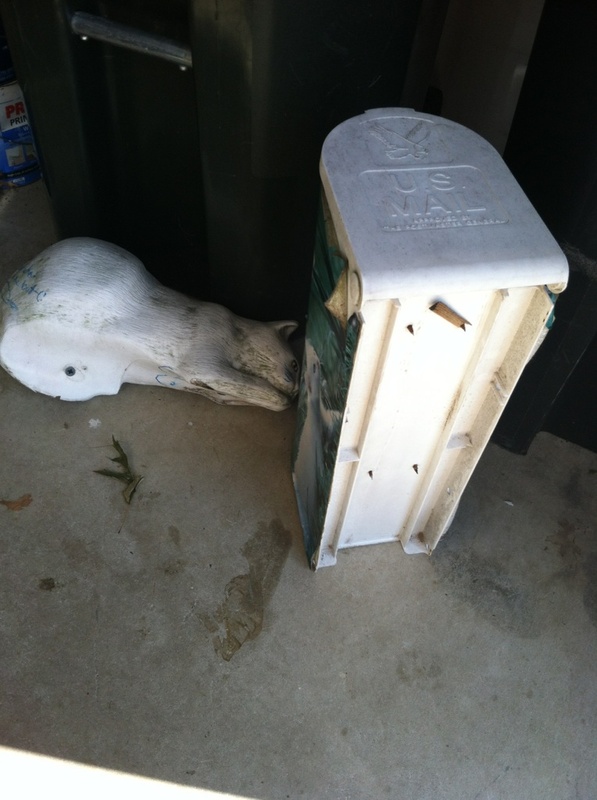 Overall, despite now having to get a new mail box - this one was at the end of its life, though - we have to cancel the mail. But in the long run, at least the vandal didn't damage our cars, seeing as they are all decked out with the cat family and lots of cat rescue stickers & other pro-cat decorations. The empty post. Completely empty as 10 years ago! 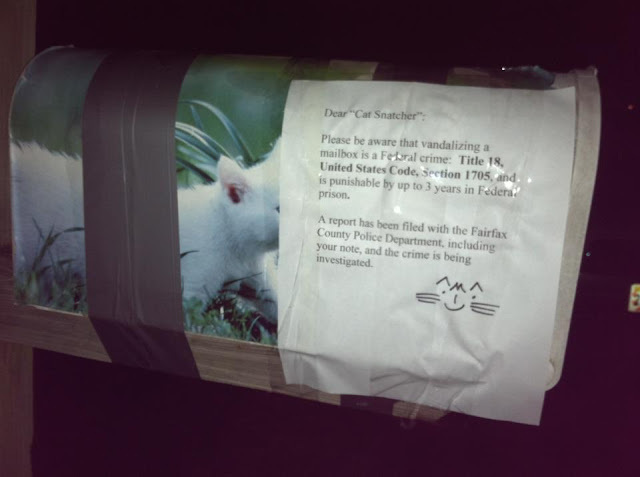 But the thing about the act of vandalism that bothers me is that not only did this person get away (so far), but that this was just a cat hating mail box crime, what would happen if this person was to come across a real cat? And unfortunately, this person will probably get away with what they did. As unfair as their childish act was, all I can hope is that they got the vandalism out of their system and are out of business. Henry bared his teeth at the note! Wow. First, I'm so sorry that someone was immature and petty enough to vandalize your property. I'd be so furious and I'm even filled with anger FOR you. 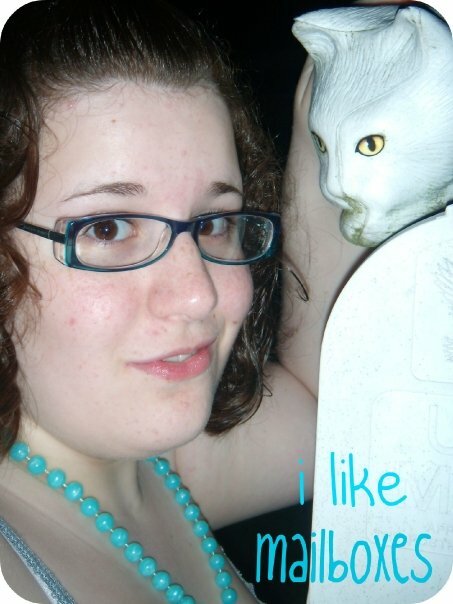 Second, it's a bit disturbing that someone dislikes cats THAT much. Actually, it's very disturbing. I hope all animals will be safe from this person's idle hands. WOw. So sorry you have such a creep in your neighborhood. I'm so sorry this happened to you. It's such a violation of your personal space, and in this case, an attack on everything you stand for. Even though it was "just" a kid, it doesn't make it any less upsetting. That is horrible and certainly scary that some sick person hates cats that much. I shudder to think what he'd do if faced with a real cat. I do hope they manage to catch him. 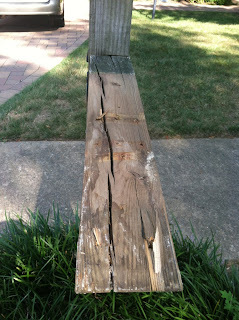 Our mailbox was deliberately hit a few years ago - driven into by a car in the wee hours of the morning. Not sure why, but that was scary as you could see the car tracks in our yard headed right for the two front bedrooms. First, the picture is SO cute (of you, not the icky other photos). Second, we're SO very sorry you had to endure this. Third: WAY TO GO telling them they're under investigation! LOVE the note you put up!! 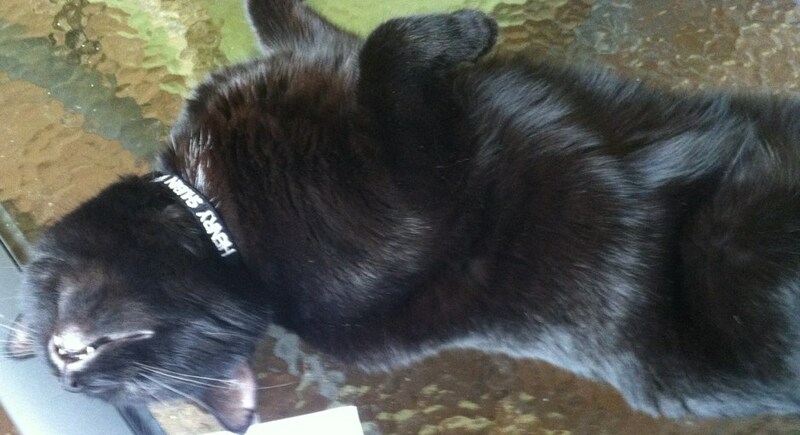 you are right to be fearful of if this horrible individual (or individualS) ever come across a real cat. This is all quite disturbing. I ALSO LOVE the note that you put up. *Sigh* Why on earth would someone do something like this. I don't understand it. I mean it is much like the 'evil villain' in most cheezy movies, that try to kill the hero until the hero gets the upper hand and then they act all shocked and hurt that someone would dare do something like that to them. Apparently they never learned the golden rule. If nothing else can come of it, I hope at least your note scares them enough to stop bothering you and anyone else. but in truth I hope that if there is an investigation they find someone and they have to pay for what they did.